Oooooh, could be tempted. Is it this one? Got it booked up! Weather looks good too! 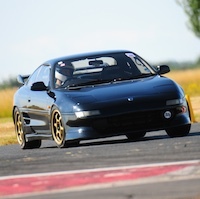 That was a great day, probably the most quiet trackday I've ever been on! Your car looked immaculate! I managed to get so much time on track the last session I ended up boiling the brake fluid! Only forty cars booked on - I've never known it so quiet. Over four miles of track to play on too.Perfect! Car performed brilliantly too. A little brake judder towards the end but like you I had so much track time I'm not at all surprised. Could just be the Yellow Stuff giving up the ghost. Bring on the next one!! Yeah I think the only time I saw you was passing you doing a cooldown lap. Btw after my braking incident I might need to invest in some ducting, I can't remember if I asked you about your setup. Funny story that old boy with the ratty turbo kept pestering me to go out at the same time as him, I did at the end but I kept my distance for the most part. Guy was pretty much going straight across both of the chicanes because he obviously didn't care what happened to his car. At the start of the third lap his engine blew or something went at least. I've seen those guys before at bedford thrashing very tired NA's, which can usually take that abuse. Also I ended up getting a passenger ride in the insanely fast blue elise, at some corners his corner speed was almost 10mph more than what I could do. Edit: I do have quite a bit of footage from the day, I'll have to sort through a load of it. I've removed all ABS and switched to a non-ABS master cylinder with an adjustable proportioning valve on the rear circuit. Running 5.1 as you'd expect, but nothing fancy. I do have ducting on the front brakes (but I forgot to add it for this session...). I made up some plates with air inlets to replace the front fogs and then ran ducting from them to the front wheel arch liners. Certainly helped on the standard setup, I was eating brake pads without it. Oh, and my Go Pros all failed spectacularly on the day so I have some crappy footage for a couple of minutes... Time to buy some new ones! !